When looking at the history of Arizona’s Flotsam and Jetsam, they could have been the next ‘big’ thing in the speed/thrash scene during the 1980’s. When Jason Newsted gained the bassist slot of Metallica following Cliff Burton’s tragic death, the A+R rep for Metallica took interest in the band, giving them a major label deal for their second album No Place for Disgrace. Unfortunately, behind the scenes industry politics being on MCA during the 1990’s plus changing tides for metal put the band in the ‘what could have been’ category – continuing to expand their sound into melodic/groove-like directions while dropping back into the independent label scene, but holding onto a mid-level following throughout. Here we are in 2019, and the band has been steadily climbing back into importance by proving their worth on stages small and large, far and wide – opening for acts like Testament, Overkill, Sepultura, and Hammerfall while also doing some headlining runs of their own. The End of Chaos is the quintet’s 13th studio album, featuring another drummer change as Ken Mary (Fifth Angel) takes over for Jason Bittner who is now in Overkill. In the end, what most care about is the passion and dedication to the art of creating powerful material that hopefully entertains and excites the listeners who love the blend of melody, precision, and exemplary musicianship into stellar songs. It’s evident by the quick hitting drum fills, superlative Michael Spencer bass action, and twin guitar activities right out of the gate for “Prisoner of Time” that Flotsam wastes no time getting down to power thrash business. The follow-up “Control” obliterates because of the furious Michael Gilbert/ Steve Conley axe picking and competitive tricks on display, allowing Eric A.K. to shine in his glorious upper register meets forceful mid-range vocals (‘you…will…not restrain me’ commandeering headspace on a regular basis). And this consistent punch and take no prisoners attitude and atmosphere continues all the way through these twelve tracks – receiving a modest lively kick in the sonic output from mixing/mastering expert Jacob Hansen. You’ll hear more melodic fare that rivals the Cuatro/Drift album cycles during “Recover” and “Survive”, plus the natural all-out thrash velocity and slash/dash musician tradeoffs for “Good or Bad” and “Slowly Insane” that are staples. Incessant headbanging will occur, along with devil horns acknowledgement for the potent pipes of Eric A.K. – still ascending to heights others only dream of attaining this deep into his career. 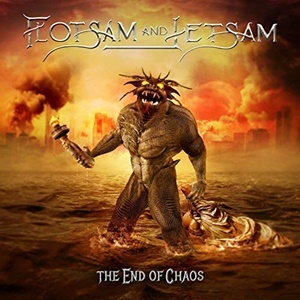 2016’s self-titled effort was a key to getting Flotsam back in the conversation for their progressive, melodic power/thrash style and abilities – which makes The End of Chaos that much sweeter for a triumphant comeback to those early Doomsday/No Place days, just with a wiser, mature, and dynamic backbone to please the metal legions.